2.Type-C interface socket size is about 8.3mm × 2.5mm slim design. 1. how long are these? 4pack type-c cables:1x1ft,2x4ft, 1x6ft. And 1ft = 0.3m, 4ft= 1.2m, 6ft=1.8m. Its maximum Amp is 3 Amp. and it have 56K resistor guarantee. 3.Will this cord support fast speed charge? Yes, the cables could support fast speed charge. But it generally needs to meet 2 conditions. a, The output power of Power adapter above 2000 mA can support fast charge (now its standard is 2700mA for fast speed charge); b, It depends on if Customer's cell phone can support fast speed charge. 4.Do the cords work for the zte zmax pro z981? 5.Do the cords work for the galaxy s7 edge? 6. How to contact the Seller? 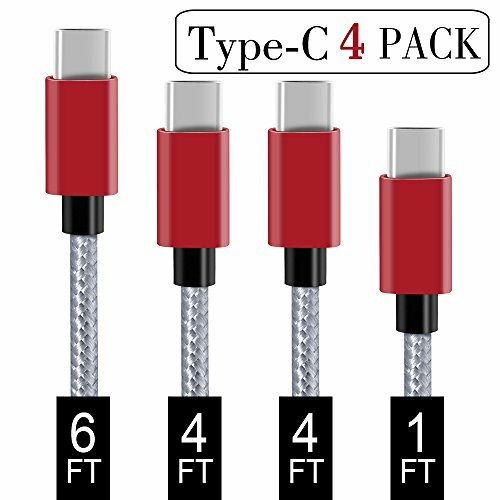 Click on"Covery" next to "Sold by", then click on "Ask a question"
What You Get: Covery 4 pack type-c cables (1x1ft,2x4ft, 1x6ft), 1 waterproof ｂａｇ. Different lengths combination meets all your demands in daily life and makes your life more convenient. COMPATIBLE WITH:Work with the new USB Type-C devices such as Samsung Galaxy S9 / S8, Samsung Galaxy S8 Plus/S8+, LG G6,G5,V20, LG Nexus 5X , Huawei P9/P9 Plus, Huawei P10/P10 Plus, Huawei Mate 9, Mate 10 Pro, Google Nexus 5X ,Nexus 6P, Google Pixel, Google Chromebook Pixel, Lumia 950, Lumia 950XL, OnePlus 2,3,3T, ZTE Axon 7, Moto Z2 play, HTC 10, Nokia N1, Asus Zen AiO, Lenovo Zuk Z1, Nintendo Switch, 2015 Apple new MacBook with 12" Retina Display and other usb type c cable device.